Celeste and Tom Revelli at Urban Village Brewing. 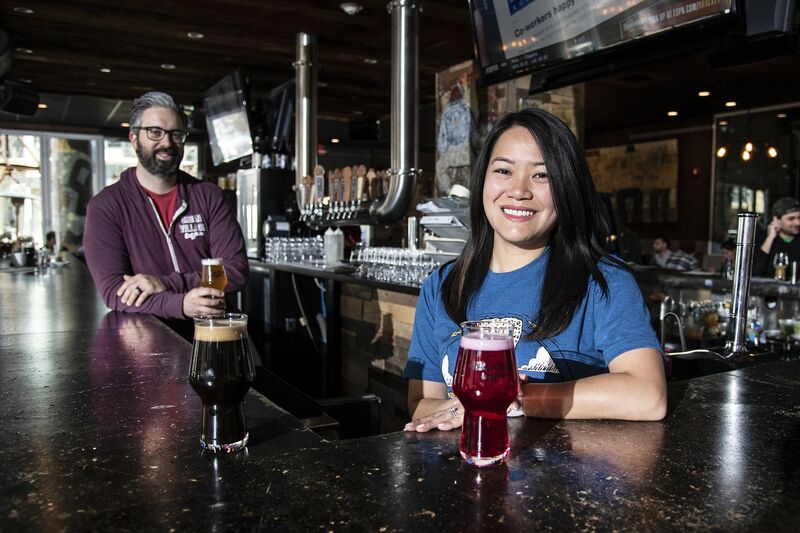 The Revellis managed to pay down six figures in student debt and get married, while Tom opened Urban Village brewery with a co-owner. Celeste works as director of financial planning at eMoney Advisor. Revelli is now the director of financial planning at eMoney Advisor in Radnor, and she creates interactive plans for financial advisers to help their clients avoid the errors she made. Pa.'s FedLoan cited for ‘failed-call rate’ for student loans. U.S. Education Dept. ‘asleep at the wheel,’ report says. Revelli grew up in Voorhees, the daughter of a nurse who emigrated from the Philippines. “My mom actually wanted a career in finance, but that wasn’t a traditional career path for women there," Revelli said. "So she became a nurse, and supported me and my brother and put us through college” in the United States. “What we didn’t know was how much it would cost down the road,” said Revelli, who graduated from Loyola University, a private Jesuit college in Maryland, in 2008 with $90,000 in debt. Looking back, Revelli, 32, would have done things very differently. “I would have researched all the options for college instead of loans — such as grants, scholarships, and financial aid. Or perhaps I should have gone to a community college for two years. I would have looked much more closely at the costs ahead of time, calculated the loan repayment schedule. Now that’s what I do for financial advisers" at eMoney Advisor, she said. In about a decade, the couple have almost entirely paid down their combined $150,000 in school loans. Tom, 37, has just a few monthly payments left, and in 2017, he and a partner opened Urban Village brewery in Northern Liberties. “A lot of money that we would normally have been saving went toward paying down more debt each month," Celeste explained. She contacted her lenders and initially went on an income-based repayment plan. And after she started working, she put extra money toward her loans from a second job, which she kept until 2016. Instead of beating yourself up for not saving, “start with as little as you want — even $5 a month” to get in the habit, she said. “When we budget every dollar, I started using sealed envelopes for funds," Revelli said. "For example, one envelope had student loans, one dedicated to vacation, rent, a new car, computer. Then I had a second job, so I did it in my bank account, or different accounts that allow you to name your goals. I paid off my loans in eight years,” instead of the typical 10 or 20 years. Celeste and Tom Revelli at Urban Village Brewing, at 1001 N. Second St. The Revellis managed to pay down six figures in student debt and get married, while Tom opened the brewery with a co-owner. Celeste works as director of financial planning at eMoney Advisor. Consider tackling the student loan with a financial adviser before you borrow. Some may offer help, while others may have no experience, but you should at least request a road map. While the median tuition and fee price for full-time students attending private nonprofit four-year institutions in 2018 to 2019 totals $36,890, 11 percent of full-time students attend institutions with prices below $15,000. And an additional 20 percent attend institutions charging $51,000 or more, according to the College Board’s latest Trends in Pricing. Alex Bottom of Los Angeles, co-founder of LoanBuddy.us, says the "We are empowering financial advisors and CFPs, certified financial planners, with technology to help their clients with their student loan debt. Understanding what happens over the life of the loan in a federal income-based repayment plan is complicated and LoanBuddy has made this simple through automation with our advisor-facing technology.” The software start-up is also about to launch a direct-to-consumer version to help parents and students.